The business world has decided to incorporate the creative way designers work to solve their own issues. Call of Design Thinking, the new knowledge strand proposes a set of innovative methods and processes for organizations. What does the designer have to do? Designers, especially those who work in product development, need to find creative ways to succeed in their designs, and end up developing a different look. Designer understands that problems that affect people are diverse in nature, and that it is necessary to map the culture, contexts, personal experiences and processes in the lives of individuals. By investing efforts in this mapping, the designer can identify the causes and consequences of the difficulties and be more assertive in the search for solutions. Another advantage is that, in its day to day, the professional mainly prioritizes the collaborative work in multidisciplinary teams, after all, bringing other visions on the same subject makes problem solving more efficient and creative. 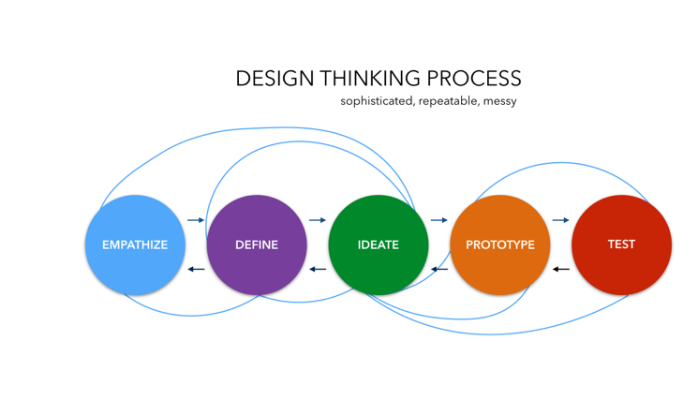 Like all methods of work, Design Thinking also entails some steps for you to be able to incorporate this thought revolution and potentialize your creative moments. The insights are discoveries that spring up suddenly after a moment of reflection and contemplation about the situation we want to solve. Therefore, it is essential to look at the problems and how people deal with it. This is where you will be able to think of new ways of resolution. approaches convergent and divergent thinking. First, the last mental model is used to search for alternatives and answers of all kinds, even if they are dubious and strange. However, it is only with convergent thinking that the individual will compare the alternatives, test them and decide which is best. The mental models are very different, and the biggest challenge is to consider the two sides of the brain to think, sometimes analytically, sometimes synthetically. In the design area, the prototype is the physical version of the product before it is manufactured. It is ideal for you to improve an idea. Even if your work is not something physical, it is possible to go through this phase, for example, by bringing simulated experiences in the service field. proposes to explore different ways to elaborate a new answer. Instead of considering the majority, he seeks alternative truths. Designer who stands out as an ‘integrative thinker’ receives the disorder with open arms, admits well the existence of complexity, because it can identify patterns in the midst of complexity and synthesizes new ideas from fragments. people are visual, that’s a fact. So, take advantage of this feature and potentiate your project. Make drawings, graphics and pictures, even on a paper napkin. Of course, it will be easier to explain and refine it. In this perspective of different views on a context, we can infer that the design is also woven by cultural fibers. A simple perception of reality can be able to produce an immense set of references (imagery, formal, chromatic, sound, etc. ), making the reading of the phenomenon a thread of ideas to solve the context of a project. Thus, considering nature as a reality to be perceived, the designer can appropriate its aesthetic and structuring aspects. Combining such elements, the product can result in a creative translation of nature. Although man has transformed the natural elements into fabricated and geometrized forms, there is no way to completely dissolve the nature of the perception of reality and the sense of coexistence of people with it. For the same reality of factory objects with which we face, there are so many other elements that color their galvanized palette: animals, plants, water, fire, sunlight. We continue, then, surrounded by manifestations of nature, and our reference to it- to a lesser or greater degree- remains. In the scope of design, inspiration in nature is a trend that has found echo mainly in the products, carrying semantic and pragmatic characteristics. In other words, many design solutions are directly inspired by nature, and this is manifested in at least two aspects of design: functional and emotional. It is important to emphasize that today there is a less orthodox understanding of what becomes functionality in design; for example, a decorative object also fulfills its function, aesthetics, although it does not carry with it elements of interaction or physical mechanisms that require the execution of a task. However, we will deal here with those products that need an operating structure, since they involve much more operational aspects than just contemplatives. In this sense, we have a functional design in its Germanic sense. Within that understanding, in what ways could nature inspire the functionality of a design? Well, it is not today that several researchers have investigated the workings and complexity of nature. Various biological structures arouse the interest of many groups in society, which is no different for industry. From the aesthetic references of nature, it is possible to establish conceptual guidelines for the elaboration of a product, emphasizing its emotional aspects. Emotional design can be decomposed into three interdependent levels: the visceral, the behavioral, and the reflexive. The visceral level corresponds to the first impressions that the product causes, its visual impact. The behavioral level is related to its functionalities and the sensations provoked by its use, leading to a confirmation or not of the perception obtained at the viceregal level. The reflective level involves the meanings attributed to the product, legitimized by the user experience. By aligning the inspirational proposal with the context of use, the designer can design beautiful works that enchant by reference to nature, combining such references to the emotional levels of design. We find in nature an uncountable variety of references to the design project. It is up to the designer to reflect on the role that the product intends to fulfill in the context where it will be applied: what are the wishes of potential users? How do they see the world around them? All this will give the contours of the aesthetics of the concept, as well as inspire an innovative bionic solution for the final product, reaching the full emotional and functional levels of design. Sarah Feldman is a Marketing Manager and is currently working with Digital Express, a UI/UX Design Agency having experienced team of front end developer in Dubai. She loves to learn and share about latest web design and development updates and trends.